A foil for the legendary Tim Horan, Little was himself a superb international centre. 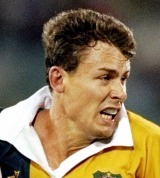 He won Rugby World Cups in both 1991 and 1999, also helping the Wallabies to the Tri-Nations title in 2000. In 1993 he threw an interception pass to Joel Stransky during a hard-fought Test against the Springboks in Brisbane, recovering his composure to show his class with two tries in a comeback victory. Towards the end of his career he battled with state team-mate Dan Herbert for a place in the Test side and also showed that he had the pace and know-how to play international rugby on the wing. A long-time servant of Queensland, he also turned out for New South Wales at Super Rugby level before moving to England with Gloucester and Bristol.